This Solaire Deluxe InfraVection Freestanding Gas Grill features commercial 304 grade, 18 gauge stainless steel construction with heli-arc welded seams, hand-polished mirror finish, and no mechanical fasteners; top-supported, self-trimming design; stay cool double skin hood; full-width stainless steel knurled tubular handle; one stainless steel convection and one ceramic Infrared main gas burner for a total of 32,000 BTUs; 14000 BTU Infrared rotisserie burner with rotisserie motor, spit, forks, and counterweight; 542 sq inches of cooking surface (362 sq inches of main grilling area) making it perfect for 2-6 people; stainless steel V-shaped grilling grates that catch drippings to enhance flavor and reduce flare ups; removable stainless steel warming rack and drip tray; and pushbutton rapid-start ignition. Burners are easily removable for cleaning. Solaires stainless steel angular pedestal base features hidden casters and two fold down side shelves. Solaire have a limited lifetime warranty on stainless steel construction, main burners and V-grilling grids. Cooking Grid Dimensions 23 X 15 5/8"
Solaire Gas Grills come with a Limited Lifetime warranty to the original purchaser that covers the structural integrity of the exterior and interior body parts and stainless steel grilling grids. Solaire Gas Grills warrants all grill components to the original purchaser to be free of factory defects in material and workmanship for a period of 1 year from the original date of purchase. This does not apply if the unit was subject to other than normal household use. All repair labor and replacement parts for one year from date of original purchase, for parts found to be defective due to materials or workmanship. This does not apply if the unit was subject to other than normal household use, nor does it include changes in finish appearance. Limited lifetime warranty to the original purchaser covers the main infrared grill burners. This does not apply if the burners were subject to other than normal household use, exposed to moisture, abused or misused. Failure to perform the after use burn-off period may result in clogged ports, which is not covered by the warranty. Two years warranty to the original purchaser covers the electronic ignition system, excluding batteries. When used in a multi-user setting (apartment complexes, multi-family dwelling complexes, schools, hotels, fire stations, police stations, etc. ), Solaire warrants this grill to be free from defects in material and workmanship for a period of six (6) months from the original date of purchase. This multi-user warranty excludes restaurants and settings where grill usage is primarily commercial. The grill is better than expected. It heats quickly and cooks quickly. We love it. Much like a muscle car, Solaire grills are built tough and offer solid performance. They have a heavy-gauge, durable welded stainless steel construction and double lined hood which protects the grill and holds in heat better. 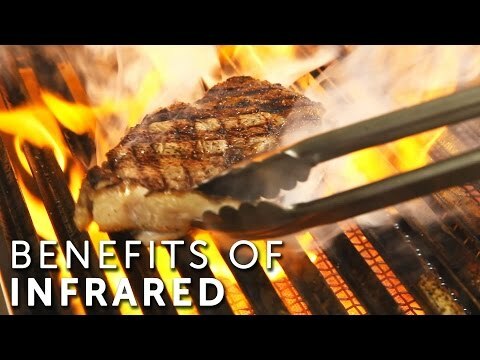 Solaire grills perfectly demonstrate the Benefits of Infrared cooking. The rapid 3 minute preheat is just one of the ways that the grill maximizes the ease, efficiency, and precision of grilling with infrared. Not only will your food cook faster with infrared, but it will also retain more moisture. The reason for this is because conventional burners heat your food with the movement of hot air, which can eventually dry out the food. Infrared burners, on the other hand, produce direct radiant heat, which reduces the amount of hot air moving past the food. Solaire's stainless steel cooking grids are "v-shaped", and collect grease and drippings as you cook. The heat from the burners vaporizes most of the drippings, adding moisture and flavor into your food. The rest of the drippings are channeled away from the heat, which helps reduce flare-ups. Solaire also has versatile burner configurations. You can choose a ceramic infrared burner, a stainless steel "convection" burner, or a combination of the two. Ceramic infrared burners produce extremely high searing heat. This style of burner is often found in high quality restaurants (infrared burners are great for getting those sear lines on steaks that everybody loves). You can also have both burner options at once, which they call "Infravection." 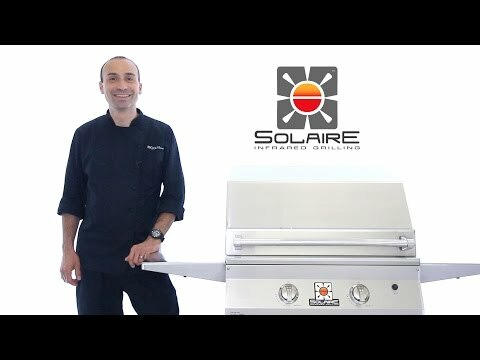 Solaire also has a solid lifetime warranty on stainless steel construction, burners, and v-grilling grids. Solaire has a good reputation and they stand behind their products with a good warranty. While Solaire's infrared burner produces an extreme amount of heat, it doesn't reach low temperatures easily. If grilling on low temperature is important to you, you may want to consider either an Infravection model, so that you can reach lower temperatures on the conventional side of the grill, or adding the BBQ tray in order to diffuse some of the high heat before it reaches the food. Solaire also doesn't have any internal or control panel lighting, which can come in handy if you grill at night. You want twice the flavor in half the time. Solaire's 3 minute preheat and its ability to retain moisture in food means that you'll be able to quickly grill restaurant-quality food, even on busy weeknights. Join the infrared revolution! Great question! The 27GIRXL puts out more BTUs and has a larger grilling surface than the 27GIR. It can also be upgraded to a model that includes a rear rotisserie burner and a rotisserie kit, whereas the 27GIR can't. 23 X 15 5/8" 26 1/4 X 22" 23 X 12 3/4" 25 7/8 X 17 1/4"